EUR is under pressure due to Italian budget concerns. The support rests at 1.14590 with resistance at 1.15060 which both lines are below the weekly pivot point at 1.15360. The EMA of 10 is moving with bearish bias in the descendant channel and it is below the EMA of 200 and the EMA of 100. The RSI is falling towards the oversold area, the Stochastic is moving in middle ranges and the MACD line is above the signal line in the positive territory. The ADX is showing weak sell signal. 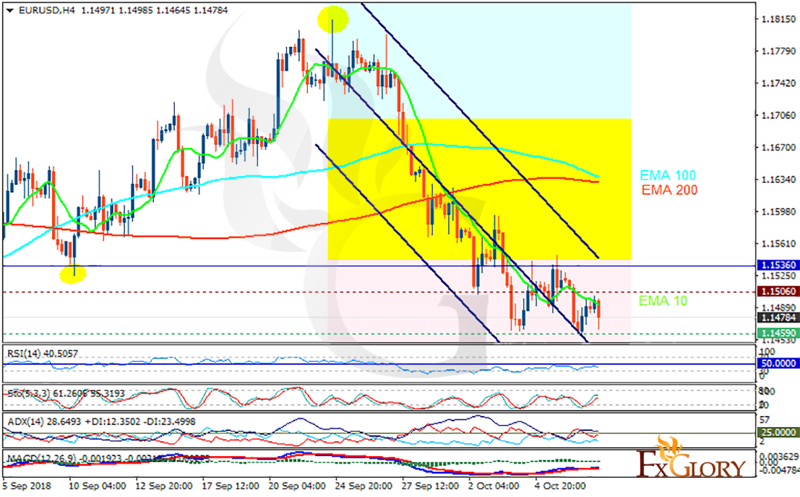 There are no strong bullish signals, it seems that EURUSD is falling down. The bearish direction will continue until the bulls reach 1.155, then buyers can expect a strong uptrend.